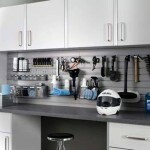 Garage organization is on nearly everyone’s to-do list, but is usually always the last place to get organized. It doesn't have to be. Let David "the handyman" help design and install storage space, shelving, and custom cabinetry and work space in your garage today. QROK can install economical storage cabinets and units bought from the store and we can even pick them up as we know not everyone has a truck. We can also build you a work space with a solid counter and/or slatted wall organization for those projects you have from time-to-time. Some people want to put in heavy-duty overhead racks for storage! David can do any of this for you. 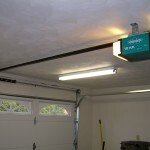 We install garage door openers and repair them. We can also do garage door repairs. Can’t get your car out of your garage because it just quit working... call us we do emergency service too. 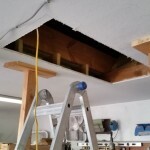 David can install an attic ladder for you or repair/replace your old one! Many times these ladders become loose because of lots of use and don't operate well. That can mess up your ceiling drywall and paint. It can also cause sagging and even a chance of falling in. Let QROK come in and fix you up right! Our handyman services can help you with your garage storage and organization around your home. Please call us now at 405-340-8526 or email David at DavidT@QualityRemodelingOK.com.